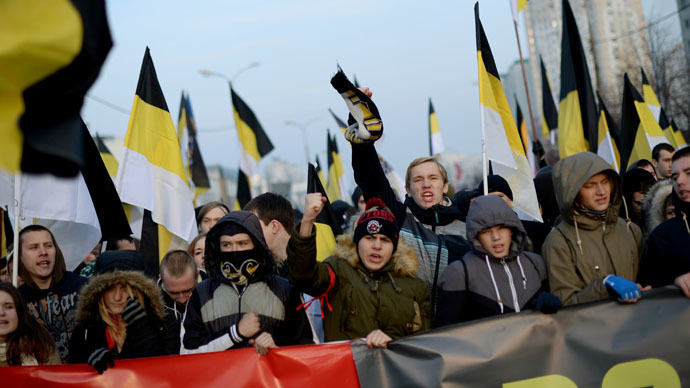 The State Duma Committee for Constitutional Law has rejected a suggestion to change the existing white, blue and red flag of the Russian Federation to the black, yellow and white tricolor used in the Russian Empire of the late 19th century. The bill was rejected on Wednesday almost without discussion, TASS reported. The original motion was drafted in July last year by MP Mikhail Degtyaryov of the populist nationalist party LDPR. The lawmaker claimed that the imperial flag was much more appropriate at current historical stage marked by many important events, such as Crimea’s accession into the Russian Federation, the start of the Russia-led economic bloc the Customs Union, and the rise of patriotism in general. Degtyaryov also notedthat when the Russian state was using the old flag its territory increased greatly and included Alaska, the Caucasus, Crimea, Eastern Prussia, Poland, the Baltic States, several Central Asian states and Finland. The suggestion met strong opposition from lawmakers and the community the moment it appeared. MPs said that the populace was content with the existing flag and the costly change was simply unnecessary. The head of Russia’s Monarchist Party, Anton Bakov, noted in press comments that the move was discrediting the very idea of monarchy. “How can Russia use the Romanov dynasty flag before the descendants of the emperors return to their homeland? The tsars got the Kremlin stolen from them, and the Hermitage Palace. Now the LDPR deputy wants to steal their flag,” Bakov told reporters. The black, yellow and white flag was approved as a national symbol by Emperor Alexander II in 1858 and remained as such till 1896. According to the official explanation the flag borrowed the colors from the imperial coat of arms – the Byzantium eagle was black, the Byzantium banner was gold, and the horse of St. George, also pictured on the Moscow City emblem, was white. However, the black, yellow and white scheme was also used by German Kaiser of the same period, and back then Russia allied with Prussia and other German states. Various combinations of the imperial standard and the white-blue-red tricolor were used between the 1896 and 1917. Modern Russia approved the white, blue and red tricolor in 1991. It was the flag used by supporters of Boris Yeltsin during the 1991 coup attempt and was modeled on the flag of the Russian Republic – the state that existed between the Tsar’s abdication in February 1917 and the October Revolution. The official explanation of the tricolor colors was the claim that it symbolizes the principles of Russian statehood. These days the imperial standard is used only by fringe Russian nationalists who blame Yeltsin and his pro-Western policies for most of Russia’s present-day problems.